First we want to brainstorm! I want you to just scribble out a few quick answers to these questions + anything else that pops into your head about the upcoming season. Getting it all out on paper is going to be super helpful. What’s your overall Holiday Budget? Do you already have some money saved? How long do you have to save the rest of the money? Who do you want to buy gifts for? Who do you want to send cards to? Are you hosting any events? Are you attending any events? Are you traveling to visit loved-ones? Are you planning to donate to charity? What else will you need to spend money on? Okay, now let’s turn that brainstorm into something a little more legible! If you’re like me, a nice neat set of worksheets are always helpful at a time like this! Sign up below to grab my FREE Printable Family Holiday Budget Planner + let’s work through this! Since budgeting for something so large can be a bit overwhelming I’m going to help you break it down into a lot smaller more manageable areas. Download that Family Holiday Budget Planner that I linked to above! Print it out + let’s start with page 1 to get yourself a solid Overview Holiday Budget set up! What’s your total Holiday Budget? Decide how much you’re able to spend overall, and then work through how you’ll break it down. Family Holiday Budget Planner Tip for Success: Use the “Estimated” column to plan ahead for how much you should spend/how much you can spend. Use the “Actual” column to keep up with your running totals throughout the Holiday Season so you don’t go over budget. Now let’s work on your game plan for getting that Holiday money saved! If you’re using the Family Holiday Budget Planner you can jump over to page 2 to set up your Holiday Savings Plan. If yes ...how much? ...how much more do you need to save? If no ...how much would you like to save? What’s a realistic amount? How many weeks or paydays do you have left between now + Christmas? Take your total amount you need to save and divide it by the number of weeks or paydays you have left. That’ll tell you how much you need to be saving during each Budget Period. Can you afford to set your goal money amount back each Budget Period after you pay your bills and buy groceries + such? If that amount works for you then awesome! Consider opening a separate savings account or setting aside the cash in it’s own envelope so you don’t accidentally mix this money up with your other money. If that amount is more than you can swing then we need to talk about where to find that Holiday money! First, consider cutting back your Holiday Budget to something you can afford more easily. Also, make sure you’re doing a unique budget for every single budget period, and that you’re being intentional with every dollar that you earn. If you need some help taking control of your Spending Budget then check out my free 5-day Email Course here! I also have tons of ideas on how to create some wiggle room in your budget...and I share my top 33 favorite tips here! Or maybe you’ve cut back everywhere you can, and you need to earn some extra income during this season. 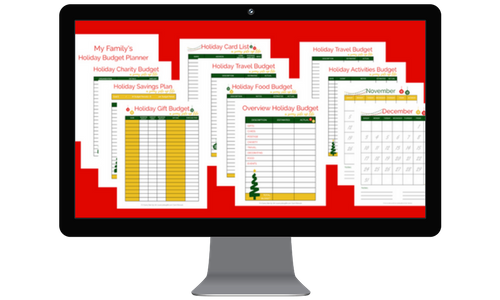 sign up to receive my FREE Printable Family Holiday Budget Planner to get yourself organized! The biggest part of your Holiday Budget is going to be the gifts so let’s work on that section. 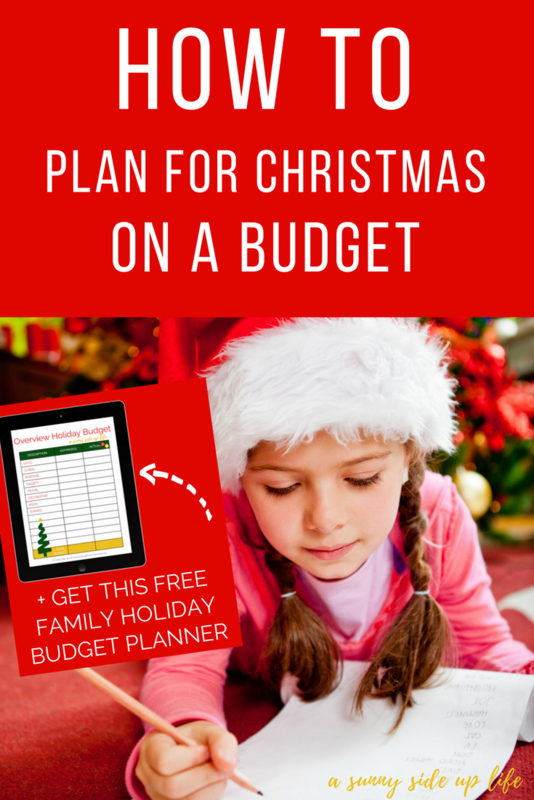 Grab page 3 of my FREE Printable Family Holiday Budget Planner. How much can you spend on each person? Now that you know the total amount that you can spend on gifts, and who you want to give to, we can start to break that overall gift budget down per person. Remember to be realistic with how much you’re allowing yourself to spend on each person. We don’t want to encourage ourselves to overspend, but we also don’t want to set ourselves up for failure by under-budgeting either. So pick an amount that you can afford within your overall budget, but also an amount that will allow you to give a thoughtful gift to each person. Remember that thoughtful doesn’t always have to equal expensive though, and we’ll talk about that more in PART 2 of this blog series. After you’ve listed out each person’s name + their gift’s budgeted amount, add up your total. Is this total more or less than your total gift budget? Make adjusts until you’re right on budget. By referring back to the total gift budget you’ll be sure to not overspend this Christmas...therefore you’ll be able pick right back up and continue on your journey to reaching your bigger money goals once January rolls around. No more overspending, going into debt, or waking up with regret on December 26th. This year we’re planning ahead for Christmas + we’re doing it right! Do worry too much about what specific gift you’re going to buy for each person or where you’re going to buy it from yet….we’ll talk about that in Part 2. Right now we have to lay this solid budgeting foundation before we even start thinking about shopping. I know that not everyone still sends Christmas Cards, but if your family does then you’ve got to make sure it gets a place in your budget! Use page 4 in the FREE Printable Family Holiday Budget Planner. Who do you want to send a card to? Let’s list out people you want to send Christmas Cards to. List out how many cards you'll need to buy and how much postage they'll require. That way no one will get forgotten and you’ll make sure to include the card amount + the postage amount in your budget as well. I’ve even provided a handy box for you to check each person’s name off after their card has been sent! Where will you buy your cards from? Deciding where you’ll buy your cards from will play a role in your card budget. You don’t have to completely decide right now which specific cards your family will use, but it might be a good time to at least get a ballpark amount of how much they’re going to cost. A lot of us love to be extra generous during the Holidays (this can include Thanksgiving + Christmas)...and if you’re planning to donate to those in need don’t forget to include it in your budget. Use page 5 in the FREE Printable Family Holiday Budget Planner. What charities do you want to donate to? Make sure to include the organization’s name + the amount you plan to donate into your Holiday Budget. Also include any other notes you'll need to remember like drop off deadlines, specifics for items needed, etc. There are so many ways to help others during this time of year...even more than I listed! So if you’re feeling the tug at your heart to give to those in need, make sure to include it in your budget. A lot of us travel during the Holidays and we need to make sure this area gets included in our budget as well. Use page 6 in the FREE Printable Family Holiday Budget Planner. Remember that “traveling” can include anything from extra gas money just to drive an hour or funds for a cross-country flight, baggage, and a hotel room. Use Gas Buddy to see a gas prices map for all around the country, find the cheapest price near you, + calculate how much your trip will cost in fuel. Pack as much as you can before you leave home + stop at a grocery store instead of a gas station for needed items along the way. Use Cheaptickets.com or Expedia to find the best prices on flights. Being flexible with your date, time, and number of layovers can help you get cheaper tickets. Usually early morning, late night, and Christmas Day flights are cheaper than other flights. Make sure to change your search results to “Price (lowest) first" so you can see the cheapest options at the top. Remember to book your flights as soon as possible to ensure you’ll get the best deal because ticket prices will go up as the date gets closer. Also, make sure to give yourself plenty of time to shop around. And don’t forget to calculate your baggage fees on top of your ticket prices. Use hotels.com or Expedia to find the best prices on hotels. Consider booking a stay at the cheaper hotel chains such as Motel 6, Super 8, or Best Western...just to name a few. Often times you can still get a really nice room at these cheaper locations; and if you’re traveling to visit family you probably won’t spend much time at the hotel anyway so extra amenities + luxury sized rooms won’t matter very much. Read customer reviews + check out the Google Maps street view to help get a better feel for your hotel options. Simply taking some time to think ahead + plan ahead for the travel side of your Holiday Season can keep these expenses off of the credit card and onto the debit card instead! If you’re planning to add some new decorations to your Christmas decor stash then make sure you’re adding that into your budget as well. Use page 7 in the FREE Printable Family Holiday Budget Planner. Right now let’s just get an overview budgeted amount for the decorating section of the Holiday Budget. Since most of us don’t decorate until late November/early December we’ll wait to go into more detail about this until later in the blog series. During Part 4 of the series I’ll share my favorite places to shop for decor on a budget + some fun/cheap inspiration. If you’re planning a large meal or a Holiday event that will require snacks or desserts you might need to up your food budget for November + December. Use page 8 in the FREE Printable Family Holiday Budget Planner. We’ll talk more about planning Holiday events on a budget in Part 5 of this blog series, but right now let’s just brainstorm when we’ll need extra money in the food budget. Thinking ahead + trying to anticipate these added food expenses will really help you stay on track during this season of feasts + extra desserts. A lot of us love to host parties or take our kids on fun outing this time of year, but we have to remember to include these activities in our Holiday budget. Use page 9 in the FREE Printable Family Holiday Budget Planner. Again, we’ll be talking a lot more about planning Holiday family activities on a budget in Part 5 of this blog series, but right now let’s at least set an overall activities budget. Use the November + December calendars included in the FREE Printable Family Holiday Budget Planner to help you map out these events + get a better idea of what will require it’s own money in your budget. The key to planning for Christmas on a budget is to simply take the time to work through all of the areas I mentioned above. Try to estimate + anticipate your family’s expenses so you can have the best budget-friendly Holiday as possible. Don’t feel obligated to add an amount into each category. Having a zero dollar amount is perfectly fine, especially if your budget just won’t allow any spending in that area or that area doesn’t apply to your family. Make a budget that will reflect YOUR family’s priorities + expectations for the season. If this is your first Holiday Season on a budget then you might already be dreading spending the extra money or you might be nervous about trying to squeeze everything you want into a tight amount. I’ve totally been there friend! My family went from charging Christmas on credit cards to spending under $500 for the entire season on our family + friends list of over 30 people! Although Christmas on a budget does require a bit more forethought, it can be done...and done well! Stay on top of these worksheets + keep them handy as you’re doing all of your Holiday shopping to ensure that you’re staying on budget through this busy season. Also remember that spending more money won’t guarantee a better Christmas. I firmly believe that this season is about spending time with family + friends, giving, sharing, and simple traditions. Going into debt won’t make your kids have better memories or bring you closer to the true spirit of Christmas. Regretting all of your purchases on December 26th won’t help your family reach their long-term goals. My hope for you is that this article will help your family prepare for + pay cash for all of your purchases this Holiday Season. No regrets this year, okay? ...promise me that friends!